Imagine a young child lying awake consumed with pain. Seizures that clench the teeth, headaches that shut the world out. Reaching for a loved one, someone, anyone to make the pain stop. Just when it seems to be over the muscle spasms reminding that conditions like these do not end, but seem to intensify with time. This is what Trey Brown has endured for many years. Until his mother, who could no longer stand by and watch her only son’s life be devoured by pain, decided to do what she knew was right. After a baseball injury several years ago, in which Trey suffered a traumatic brain injury, he has continually suffered from many debilitating ailments including: headaches, muscle spasms and seizures. It got to the point where Trey was so unhappy, in such constant pain, that he began punching and cutting himself. 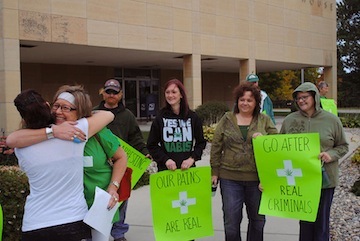 Trey’s mother Angela made the decision, fully understanding of the legal ramifications, that she would travel to Boulder, Colorado and seek out the known cure to her son’s pain, cannabis oil. The very same cure that our leaders would have the people believe is addictive and incredibly harmful. Within an hour of his first dose, this “so called” schedule one substance, cured young Trey of what our modern medical community could not. In the afterglow of seeing her son enjoying a life that she only prayed he would once again have, she made the simple mistake of thinking others would be as free thinking as she. Not feeling that any wrong doing had occurred, with the proof in the pudding, as Trey stood there in perfect health, Angela openly talked about her son’s miraculous healing with cannabis oils. For some unfathomable reason, one of these listeners ran to the police and Brown was directly charged with child endangerment. The cannabis oils that had cured Trey where then taken away and he was left to endure the “justice” that was being served, which coincidentally, felt very similar to once again being overwhelmed with seizures and pain. Thank God for the “Good Samaritan” and our Federal Government, who so obviously care for this child’s well being that they took away both his medicine and his mother in one fell swoop. The part of this story that will make both advocate and prohibitionist alike furrow their brows is the fact that in Minnesota, where the Browns currently reside, the law to allow just such a use of medical marijuana was just passed and goes into effect in January. Why the State Prosecutor is choosing to go forward with these charges, when in just over two months the law threatening to put Angela Brown in prison for two years would no longer exist, is a good question. Now there is an important point that the anti-marijuana groups would have the average person overlook. There is a very large difference between smoking marijuana and using medical cannabis oils to treat an illness. Are there those who abuse these new laws to gain access to marijuana? Yes. Are there cannabis oils that can get you high? Yes. However, oils used in he medical capacity, outside of pain treatment, rarely contain high amounts of THC. In other words, they do not get you high. Do not let these simple few who abuse the system and those who would mislead the public overshadow the much larger picture. Every law has it abuses, and with cannabis it is quite minimal. Adolescent abuse of alcohol is more prevalent and far more dangerous yet it is readily available in every corner store. These contradictions that keep medicine from those in need are what gave rise to amazing companies such as Realm of Caring. Organizations that chivalrously and purposefully circumvent an unjust law that has no medical or civic value. Groups that have no moral qualms about simply ignoring a law that is so obviously incorrect that almost 60% of the country agrees that it should no longer be in place. These pioneers of the cannabis age have no issue with sidestepping the Federal Government; a group of men more concerned with financial contributions than seeing through the one job they were chosen for; bringing the majority will into action. One of those men is Richard Stulz. Lac Qui Parle county attorney, Richard Stulz, is trying the case. Many thought the case would be dropped due to the impending law change being a close two months away. However, Stulz is moving forward with every intention of seeing Angela serve the full two years in prison. This is a mockery of our legal system and a waste of time for the citizens of this county. Why a loving parent only trying to relieve the pain of her son would be made an example of is beyond comprehension. Make no mistake, she is being made an example of. This is the dying effort of a losing battle. The last gasping breath of a war forged on profiteering and deceit, the war on drugs. Many groups have risen to stage peaceful protests and actively bring attention to this gross injustice, as any with the ability should. This is an issue of immense importance. It sets a precedent that will be referenced for years to come. Stand up and speak out. Write about the need for change, start a petition, grab a microphone, stand on your roof and yell to the world, we will not allow this any longer. We are the people of The United States of America and on this, we are united.